La Tontouta International Airport or Nouméa - La Tontouta International Airport (French: Aéroport de Nouméa - La Tontouta) (IATA: NOU, ICAO: NWWW) is the main international airport on New Caledonia, serving the city of Nouméa. 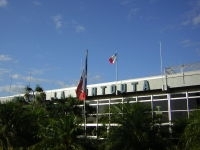 The airport is located in the municipality of Païta, approximately 52 km northwest of Nouméa. In 2006, 415,813 passengers used the airport. NB: Air Caledonie International (Aircalin) flights to Osaka and Tokyo are code-shared with Air France, and connect with Air France services to Paris. Terminals: Passenger Terminal, Cargo Terminal, five aircraft stands. The airport has an annual capacity of 2,000,000 passengers which are accommodated in 13 check-in desks and five gates. There are 320 short term parking spaces and 120 long term parking spaces. This page was retrieved and condensed from (http://en.wikipedia.org/wiki/La_Tontouta_International_Airport) see Wikipedia, the free encyclopedia, July 2008. This information was correct in July 2008. E. & O.E.